It really does not matter in which season a sunny spell occurs; the English people know how to make the best use of it. If the sun shines in the summer, spring, winter or autumn, they make the best use of the dry spell by visiting the best waterside restaurants, park cafés, alfresco courtyards and pub gardens. The British park cafés were known for crumbling cakes and soggy sandwiches. However, London’s green spaces have seen some great additions in the recent times. Whereas Hyde Park’s waterfront Serpentine Bar and Kitchen serves British delicacies, The Lido café is a prominent place where you can treat yourself either to cakes and tea or other things that are more substantial. 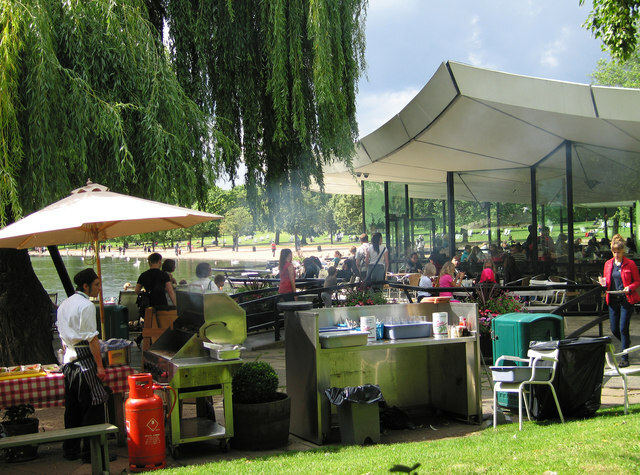 The Garden Café located in the Regent’s Park’s Inner Circle is a great place for simple British food. The leafy surroundings at The Terrace located in Lincoln’s Inn Fields make City dining more colourful, whereas Inn the Park at James’s Park offers a fantastic backdrop with ducks swimming in the pond, despite the fact that the reports on their service and food reflect mixed feelings. In the west, Holland Park’s The Belvedere remains the dependable spot for sun soaking. Many of the restaurants that are not located in parks have their own gardens. The most posh alfresco courtyard in the capital is The Ritz in Mayfair. The green space at Fredrick’s in Islington is a little more low-key place. Located in the central parts of the City, Coq D’Agent’s beautiful rooftop garden is the ideal place for sipping a G&T. On the other hand, Boundary’s rooftop restaurant is popular for its working lunch. Both Brinkley’s as well as its sister restaurant in Chelsea, Wine Gallery, boast of beautiful gardens and are known for the low mark-up wines they serve. It is the sunshine that shimmers on the water that makes alfresco dining a great experience. Several restaurants are located alongside the River Thames as well as its estuaries to take full advantage of the same. Northbank located on the Millennium Bridge’s northern side is great place to enjoy drinks and dinner in the evening. If you take a stroll alongside the South Bank, you will come across many riverside treats. They range from the eighth-floor balcony of the Oxo Tower to the Butler’s Wharf that offers a peaceful setting. Whereas the Le Pont de la Tour boasts of polished outdoor space and Butler’s Wharf Chop House is a more relaxed space. If you want cheaper and cheerful restaurants, a number of chain restaurants that offer alfresco terraces are available outside Royal Festival Hall. Also, check online for restaurant offers, particularly in midweek as you can get some great offers on your food. Another destination when it comes to waterside dining is Docklands. You will find Westferry’s Royal China and The Narrow, the gastropub at Gordon Ramsay’s, to be a couple of good places. Further down the river, at Fulham’s Imperial Wharf you will find Saran Rom, the Thai eatery. If you head west, you have the Gaucho Richmond which is renowned for the riverside steaks that it serves and Battersea’s Ransome’s Dock which serves fine wine as well as food. In central London, you will find Rotunda restaurant in King’s Cross to be a very useful choice. When there is sunshine, beer gardens are the place to be in. London offers a wide range of beer pubs. You have the option of Grand Union Public House with its terrace on the canal side or The Westbourne with its courtyard in Westbourne Park. The Drapers Arms, an Islington gastropub, and The Albion, the neighbouring restaurant, both have vine-clad gardens where they serve fabulous food. In Hampstead, you will find the new additions The Freemasons Arms with its big beer garden and the roof terrace in The Queen of Hoxton, great spots where you sip a couple of drinks in the summer. Henry J Beans in King’s Road and The George Inn in Borough Market are not restaurants for gourmets, but both of them sport great courtyards that can pack in the thirsty crowds returning from work. If it is prawns that you want, then you must head to the riverside terrace of The Gun in Docklands. If you want a pub that is a bit more active, you can try out Corney & Barrow’s Exchange Square which offers croquet matches on their lawn. Cobbled courtyards, quaint and typically British, are some of the best alfresco areas in London. Hush’s appealing courtyard in the centre of Mayfair draws in great crowds. Aubaine and Momo that you will find on Heddon Street offer sufficient outside tables, whereas Bentley’s is a good spot for alfresco dining. For lunch, RIBA’s paved terrace behind Oxford Circus is a lovely, quiet place. For dinner, Manicomio on the King’s Road which serves freshly made Italian dishes is an alfresco area that looks great when it is lit up. Some of the other spots in the City are Bleeding Heart with tables and chairs in its old-fashioned courtyard, Taberna Etrusca that has one of the biggest courtyards in the Square Mile and The Zetter and ZTH that offer outdoor eating space which overlooks St John’s Square. A couple of Soho’s rare finds are the Aurora’s courtyard and Quo Vadis’ terrace. What better way to enjoy your food than in restaurants in London with a view? All said and done, you have to give it to those who have provided retractable roofs over the dining areas in order to deal with the English summers that are highly unpredictable.